My Receipes: Kids friendly Chapathi & Awards! My girls are very picky eaters and I have to think something or the other to make them eat veggies and now a days, I have to pack their lunch box. This is something which is shared by one of my aunt. I tried this with my girls' and they are eating this chapathi really well. Best part of this chapathi is, it is filled with veggies. The quantity I have used here is very less. Increase the quantity accordingly. First pressure cook potato, carrot and raddish. Mash the veggies and add it to the wheat flour, add salt, sesame oil and required amount of water and make it soft dough like chapathi dough. Here we don't have to add more water, since the water in veggies will help us to knead the dough soft. Keep it aside for 10 mts. 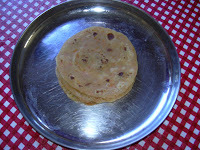 Make small chapathis ( I use small yogurt box lid size) and cook it on hot stove. Serve it hot to kids adding a teaspoon of melted ghee on top of it. Tomato ketchup can be a good sidedish. Sripriya has passed me this wonderful award. Thanks Sripriya. I Would like to pass this award to Jaishree, Sireesha, Priti, and Dershana. Shama has passed me the wonderful friendship coffee cups which I have posted it here. I would like to pass this particular award to all the fellow bloggers who visit my blog every day. 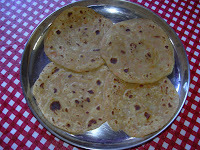 Awesome and healthy chapati......Definitely I will try this for my daughter as she is also a picky eater.Thanks for sharing such a nice recipe. nice recipe...healthy too! !congrats for the awards..
a nice way to make kids eat veggies .. even grown ups will luv this ..
Hi Vidhya, it is indeed a good idea :-) thank you so much for the award. will post it with my new post. Hi Vidhya Nice Recepie..Congrats on the award and thank you so much for passing it on to me! nice way to make veggies go into kiddo's tummy...thanks for sharing and congrates on ur awards..